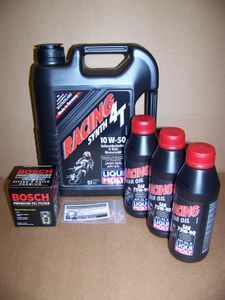 4 liter jug of high quality German Liqui-Moly Racing 4T Synth 10W-50 engine oil, 1.25 liters of Liqui-Moly 75W90 Synthetic gear oil, plus a Bosch Oilhead oil filter, drain bolt crush washer, and transmission/final drive crush washer set. This is the fully synthetic engine oil with API-SL JASO MA rating and the fully synthetic 75W90 gear oil (GL-5 rating). This is enough for 1 engine oil change on you Oilhead bike with a little left over for topping up and 1 trans and final drive oil change. For all Oilhead R850/1100 (all) bikes . 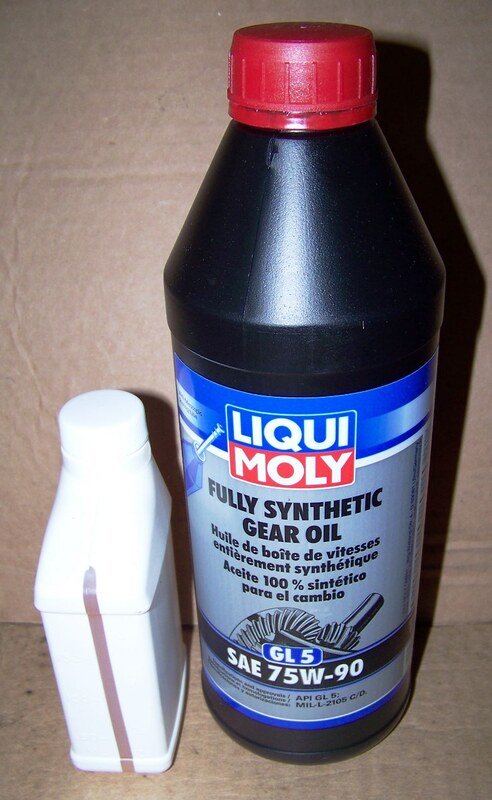 Please note: Liqui-Moly has changed their packaging on their gear oil from 500ML bottle to 1000ML bottles. This kit now contains 1.25 liters of gear oil as shown in the inset pic, not the 3 500ML bottles shown in the main pic.